Why isn't this site named cheap retirement living instead of frugal retirement living?... what's the difference between being frugal and cheap... I get asked that all the time... and by the way being called cheap does not offend me in the least...being called wasteful would get my attention. 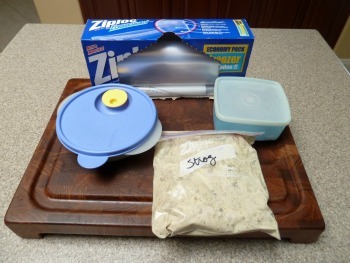 Here are two items that we use on a daily basis, Tupperware products and freezer bags. Some might say that freezing leftovers is cheap... I think it's frugal... why? Take a look at our number one tip for saving money...not only does it save money, it improves relationship communication, and it is healthy. I read once that people search most for three things online... health, wealth and love. This tip accomplishes all three, and the products that you see displayed on our kitchen island are used every day as a result of not only preaching this tip but using this tip. When we travel, we first try to plan our trips, where motel stays are kept at a minimum. But after driving 10 hours (in our case usually in the middle of Nevada), a bed is a bed, and Motel 6 almost always meets our requirements for a clean comfortable room...They may not have a fancy breakfast buffet... but we are usually on the road before dawn, so a breakfast buffet is a nonissue for us. Some would call staying at Motel 6 cheap, I call it frugal and non-wasteful. We always bring our own food for dinner so once we get into our room we never leave until the next morning... we could care less if there is a wonderful pool, a lounge, or concierge on duty. A recent page that shows areas where you should purchase the very best...in a nutshell if you buy an inexpensive mattress, that is being cheap, not frugal. If you buy a car, strictly looking at gas mileage as the primary determining factor in which car to purchase... that also is cheap, not frugal, and may place your family in unnecessary danger. If you need neglect to get your blood tested on an annual basis, since it costs rarely over $30 to do so, and you don't need a doctor's prescription, that is being cheap, not frugal, and can result in costly medical bills down the road. One persons being cheap is another persons being frugal, I believe the key is not to waste money or resources when not necessary. So are you frugal or are you cheap? Being referred to as either frugal or cheap, is better than being called wasteful.